• COMPRESSION: leave tape, wraps, and/or compression stockings continuously through the first two nights following sclerotherapy. Then wear them during the day only for another 2 weeks. • BATHING: on the second morning following sclerotherapy, you may shower with the stockings on and then lie down in bed and change to dry stockings. For the next 4 weeks avoid hot tubs, saunas, and other prolonged exposure to hot therapies that can dilate blood vessels. • PAIN & MEDICATIONS: Some inflammation, tenderness, an bruising is common. Most discomfort can be relieved by Tylenol, ibuprofen (Advil, Motrin) or naproxen (Alleve). There is no reason one cannot take medicine like ibuprofen of naproxen after sclerotherapy. • EXERCISE & ACTIVITY: You should walk every day after sclerotherapy: at least 20 minutes day, but preferably an hour a day. Light aerobics, bicycle riding, is okay. Avoid strenous exercise, heavy weight lifting, squatting, or activities that require heavy “bearing down” or valsalva maneuvers. • FOLLOW-UP: Generally, Dr. Artwohl likes to see patients around two months following a sclerotherapy session to evaluate results and see if more sclerotherapy is needed. 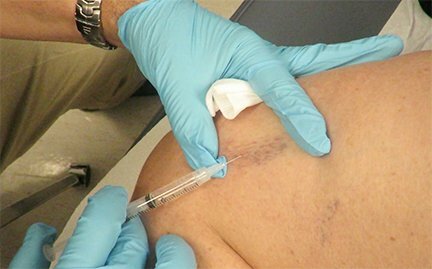 Sometimes it can take more than one session to close a vein and sometimes blood becomes trapped inside a vein needs to removed. You should have received an appointment at the time of treatment, but if you do not have one or need to change it, call the office at 907-222-6240. • HYPERPIGMENTATION: A dark brownish-red change in the skin along the sites of the injected veins is the most common side-effect seen after sclerotherapy. It can takes months to even year for it to resolve completely. In some cases it can be peramanent. It occurs as a result of iron deposition from red blood cells that been trapped in the treated area. One should avoid iron supplements around the time of treatment to reduce the risk. Dr. Artwohl uses Asclera (polidocanol) for sclerotherapy. It is the most widely used sclerotherapy agent in the world.